Each year toward the end of the semester, my inbox fills up with emails from graphic design students looking for jobs or internships. There are always a few resumes and portfolios that stick out, but unfortunately, most of them blur together in the digital monotony. My fellow designers and I want to see future designers succeed—but in order to succeed, you have to put forth just as much effort (if not more!) than you would for a school project. If you're searching for an internship or a job in graphic design, here are my top five tips to help you stand out in a sea of other applicants. A designer should never create a resume in Word. If you are looking for a job in the design world, your resume has to act as a part of your portfolio. It doesn’t have to be flashy with bar graphs, pie charts and bursting colors, but it does have to show that you know design and have sensibilities about typography, hierarchy, contrast, white space, flow, and visual communication. NO SENTENCES: Use bullets to communicate your experience and education. HIERARCHY: Put first what’s most important and sequence the following information appropriately. CONTRAST: Use color, type, bold/italics, spacing, and other ways to differentiate each part of your resume to designate hierarchy. YOUR BRAND: As a designer, you are your own brand; develop an identity that is communicative of who you are, your voice, and the type of work you do. Cover letters are pretty obsolete in the design world, so stay away from the tired format. Look for other ways to communicate your passion and interests in the way you focus your brand and voice. Have fun with it! Treat it like a book cover, an abstract collage of the work you’ve done, etc. The possibilities are endless. Whether a PDF or website, be sure to attach an outlet for the employer to review your work before the interview. A preview helps employers see what kind of designer you are and will give you a better chance of getting in the door for an interview, even if they weren’t considering hiring. When you do have your interview, be ready to present your portfolio with your physical copy. If it’s digital, bring a tablet to show. BRAND IT: Have your portfolio layout and design spring from your personal brand. Make it cohesive to reinforce your design style. PLACEMENT: Put your best piece first and your second best piece last. Choose no more than your top 10 best pieces to display in total. 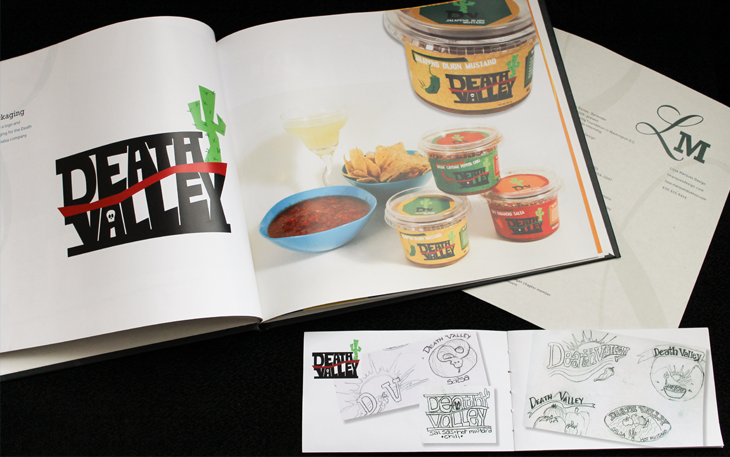 MOCK IT UP: Instead of just dropping an image of your work into your portfolio, showcase how it will be used in the real world. If it’s a billboard, mock it up on an actual billboard image. If it’s packaging, stage your designed package in the setting it would be seen, like the shelves in a grocery store. If it’s a poster, hang it up on a wall and take a photo of it. Seeing how your designs work in context will give them life. PRESENTATION: Create a professional portfolio with the best quality in mind. If physical, opt for thicker paper, a high-quality binder, and have it professional printed. Your portfolio is your most important tool and you should invest in its creation. Blurb is a great resource for creating an interesting and unique portfolio presentation. With a website/Behance/digital portfolio, be ready to present with a tablet. If it’s a PDF, make sure the dimensions fit and the colors look correct. PROCESS: Aside from the finished product, it’s important to reveal your design and thought processes behind some of your extensive pieces. Include a few sketches and brainstorming steps to show you can contribute to a bigger idea and have a strong foundation for your designs. When I was working on my design portfolio in my senior year at GVSU, I scanned all my logo sketches and other pages in my sketchbook. I turned these into a little booklet that I hand-bound and placed in my portfolio case. Paying attention to these small details and facets of your design abilities helps differentiate yourself from the competition. Just as important as your portfolio is how you present yourself and communicate your work and design choices. BE PREPARED: Dress professionally, be on time, speak articulately, and have all of your materials ready. Do some research prior to the interview about the company and come with a couple questions about the internship or job. DEFEND YOUR WORK: Knowing why you chose a certain font or color scheme for a piece will show your interviewer you are confident in your designs. Never say, “I don’t know, I just did it...” in response to a question about your work. PERSONALITY: Allow your personality to shine through and be who you are. For some design companies, the culture of the company is a big part of who they are. Knowing you can fit in is important. If there’s an opportunity, share a design anecdote or personal belief to help you be even more memorable. Create a business card that reflects your personal brand. Design it to rise above a typical business card in the way you present your information. Some of the most memorable business cards I’ve seen use a thicker paper stock and incorporate a die cut or even have a different shape. Make sure to always have some on hand and pass them out at the start of your interview. Once the interview is over, make sure to at least send a Thank You email to your interviewer. Mention something that you talked about in the interview or something about the company to ensure that it isn’t a generic follow-up. Recall a conversation point in your interview and include a relevant blog article or website on that topic with your thoughts. This gives them a little bonus that helps you stand out from other potential candidates. However, your best option for following up is a hand-written note or branded postcard. Showcase your hand-drawn type or design an interesting mailer piece to send after the interview. You have something unique to offer—make sure others see that, too! Good luck in your job search!